New thing: Each week I’ll be conducting (?) a little chat on Facebook Live to share a book or two that have inspired my own sketchbooking. Here’s the first one. The next one will be next Wednesday at 5 PM EST on the Sketchbook Skool News page. Can’t be there? We’ll upload a recording. Hate Facebook? Come back here to watch it.. Hate my blog? Watch it on the the SBS Blog. That’s enough options. Watch the video. Previous Post Let’s gang up on the inner critic. Thanks for that Danny, it’s a coincidence that I have just finished reading this book and its interesting to hear your observations too. I think books have a way of finding one, a chain of events. I found this via Cathy Johnson who took part on the last course I did Seeing. I look forward to next week..its a great idea. What a great idea! Loved seeing Hannah’s book and yes her illustrations are amazing and gorgeous! Would love a copy of her book . Great idea as a gift. I have a number of your books too and think An Illustrated Journey would be a nice addition to my collection. Thanks for the “book talk”, See you next week! Thank you, inspiring, want to get her book. Maybe will help to bring some light. 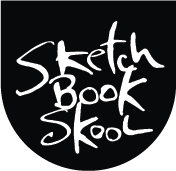 I’m very excited about Sketch Book Club! Can’t wait until next Thursday! Inspiring! This was great! Inspiring! I have A Life in Hand, but have not read it cover to cover yet. It’s going to the top of the books-to-read pile! Thanks! Great idea Danny! I liked it a lot. I got the e-book on Amazon (9.99). Half-way through the book and I believe I will get a hard copy (which is pricier) because it appears to be a gold mine of information. I am wondering if a discussion group in the student union is doable. I for one would participate and work on it. Again congratulations on another successful platform. A discussion group for the Club? Great idea, mrobert. I’ll get it done. This was great- thanks for introducing us to H. Hinchman. And thanks for reminding me of the vast trove of inspiration the books on my shelves hold. Too often, once I’ve gone through a new book, it finds it’s place on my shelf and I rarely go back and re-read. This is a great reminder to dust off those books and find new inspiration! Love the idea of the book club. I believe you were the one who pointed me to Hannah’s book some time ago in one of your books. I have it on my Kindle now with many sections highlighted. My art books are a constant source of inspiration and are all well-used (including yours). Thank you for this. Great idea and great episode. Hannah Hinchman’s three books have been touchstones for me for a long time. It’s been a long time since her last book was published. We who love her books hunger for more. Do you know if there is anything in the works? Or anything about what she’s been doing lately? And any chance of her being a SBS teacher? Would take that course in a heartbeat!!! I so enjoyed this Danny, thank you. I have A Life in Hand but hadn’t looked at in a long time and am looking forward to sitting down with Hannah once again. This is such a motivating idea – to share books on sketching. I find my books to be an endless source of inspiration. Each time I pick one up I find something “new,” perhaps something I glided over before or which at the time didn’t resonate. Revisiting old friends like A Life in Hand makes me want to draw. right. now. I enjoyed this and am looking forward to the next. RE: Your falling apart book, take it to any copy center and have them spiral bind it for you. Loved this and immediately called a friend to borrow the book. Someone introduced me to her and Clare Leslie Walker when my 30 something children were little. Then you turned up, I can’t thank you enough for hanging in there and doing what you do. It makes my life feel relevant. I have kept journals for years but it was not until sketch book stool that I started filling them. I have several going at once, my dream is to put it all in one place someday, but until then I will keep plugging away and finding my people who share a love of art and reflection on life and process. I think you are awesome! Loved the book review and ordered my copy! Great idea to review and discuss art books. This gave me inspiration for travel journals I am planning on filling soon formtrip to Nova Scotia. Love the illustrations and layout of her pages and typography. The Sketchbook club sounds very exciting ! I have been a fan of Hannah Hinchman for a long time . Her Lettering is amazing too, and I would like to learn more about how Hannah incorporates her calligraphy with her sketchings. Like Susan I did wonder if SBS will invite Hannah to teach us. Thank you for the link. This was great. Thank you, I look forward to next week’s session. Danny – Thank you for sharing this book. Coincidentally, I just started reading THE LAWS GUIDE TO NATURE DRAWING AND JOURNALING by John Muir Laws and he also gives credit to Hannah Hinchman for her influence on him. I look forward to the next book. I stumbled upon Hannah Hinchman’s book A Trail Through Leaves while on vacation and she had a high influence on my life, too. I love the idea of a Sketch Book Book Club and I can’t wait for the next episode! Any possibility of having Hannah teach one of your online programs? I am having a hard time keeping up with your brilliant ideas and new platforms you have created for us! Thank you, Danny. I loved this class and I am definitely attending this club’s meetings from now on. I was amused to see that your book is falling apart as mine is. Hannah’s work was my first introduction to Illuminated Journaling. I was a diarist in written form for years. She opened my eyes to a new world of the visual (and to having to learn to draw and paint!) Thanks again. I love this! love learning about what inspires & informs artists be it books, tools, peeps, environments. I love that you give an option to fb (I no longer like fb or go on it) and love that you don’t spell club with a k. you’re an inspiration danny, thank you! I enjoyed your talk, but missed as much as I heard. Is there some way you can turn your mike up. I had my sound up as loud as possible and still could barely hear you at times. I might have know you were a fan of Hannah Hinchman! She’s been an inspiration to my drawing practive for a long time. A sketchbook club……..What a fabulous idea Danny……..two of my favorite pastimes in one hit……genius!